If you know me, you know that I have a weakness for vintage things and oddball types of things. Combine the two? Winner, winner, chicken dinner. 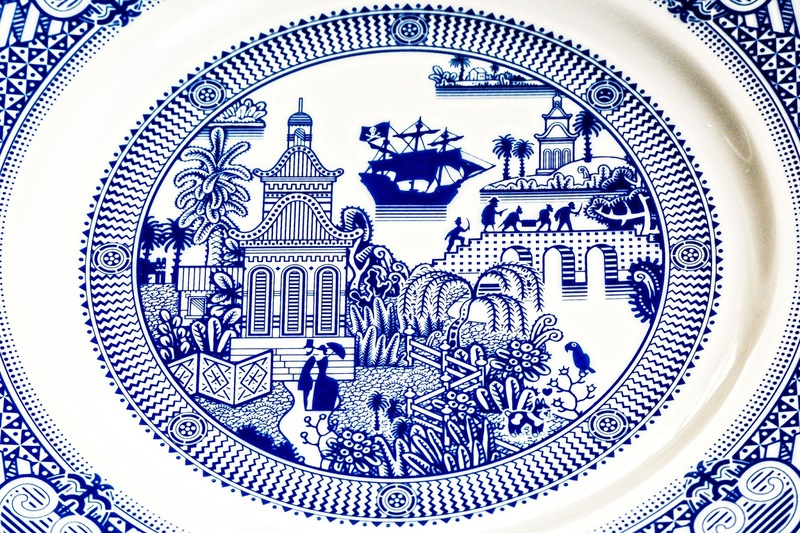 I recently heard about this utterly amazing company called Calamityware, and once I saw their dishes, I knew my kitchen wasn't going to be complete unless I got my hot little hands on some of their pieces. At a glance, the dishes look like your standard vintage Blue-willow patterned pieces. However, when you look closer, you'll see that the art on each takes on a whimsical and clever spin on the traditional serving-ware. The art comes from Don Moyer, a retired graphic designer who, upon inheriting a traditional Willow-pattern plate, decided to sketch it in his notebook. He then was tempted to draw a pterodactyl in the sky, and as they say, the rest is history. When I study the art on my Calamityware porcelain plates, I am completely mesmerized. Here on design #5, Pirates, you'll see flora, fauna, architectural marvels, innocent victims and hidden romance. 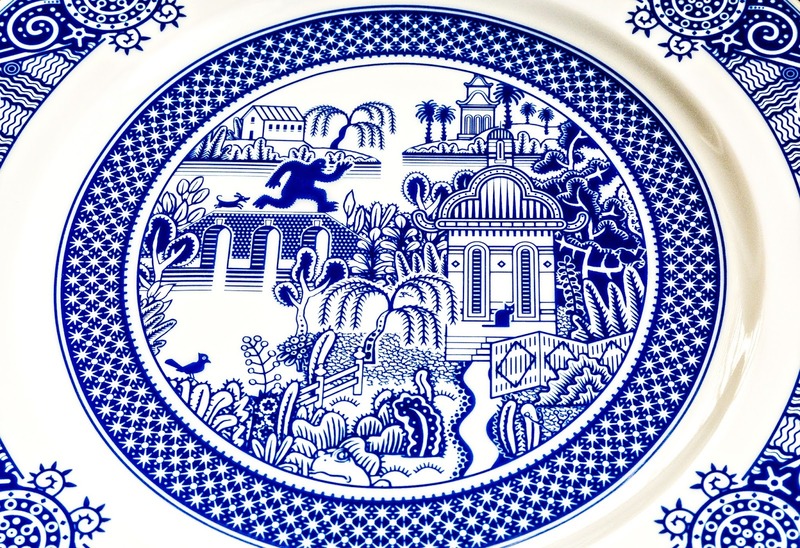 On plate design #10, Sasquatch, you'll see the best himself on a mission to stomp through the village. I love that he's being chased by a little dog, too! I am always happy to start my day with a hot mug of tea, and I get an extra little smile on my face studying the art on my Things Could Be Worse Mug. The description of this mug says that no matter how bad your day is going, things could always be worse. You could be chased by UFO's, pestered by pirates, or plagued by giant frogs. How funny is that!? 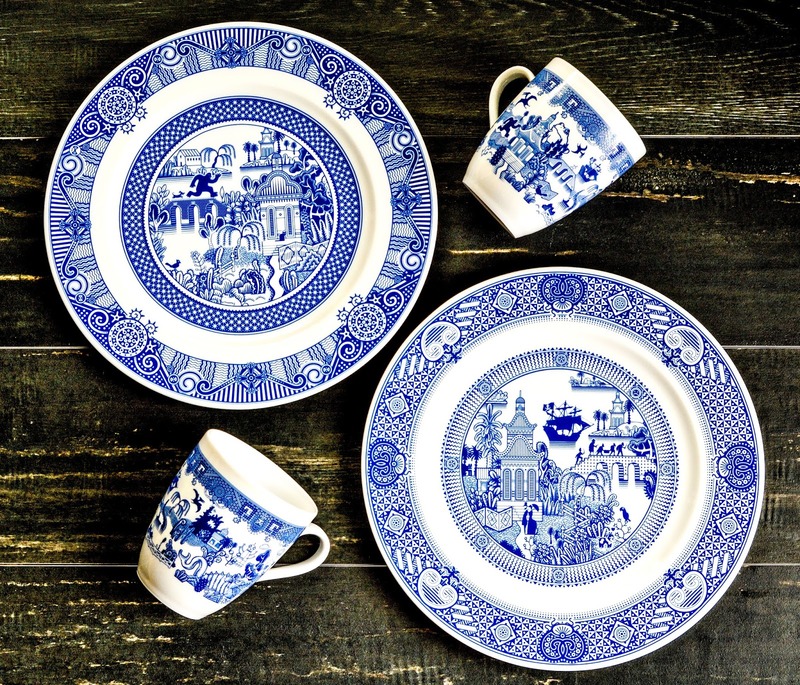 The Calamityware tableware is made from porcelain. The plates measure 10.5". They are food safe, microwave safe, and dishwasher safe, as are the 12oz mugs. 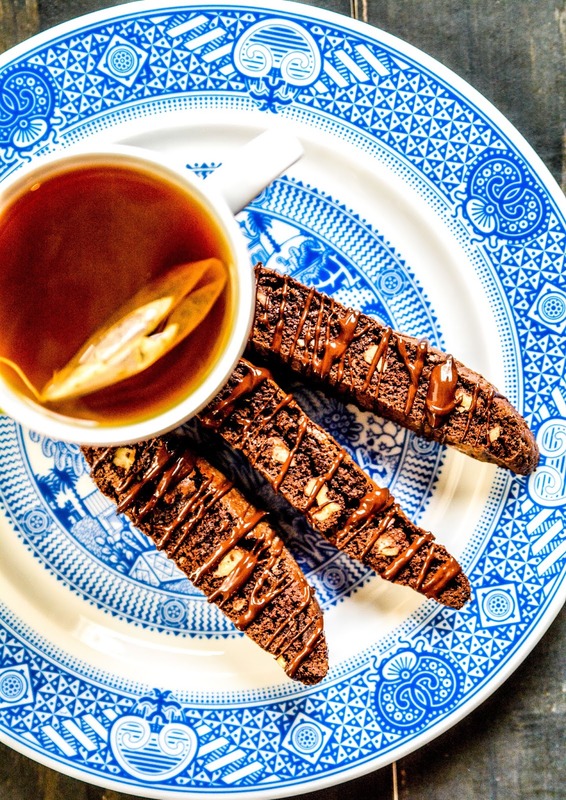 I first used my Calamityware with my favorite Triple Chocolate Biscotti Recipe. Preheat oven to 350 degrees F. Line two large baking sheets with parchment paper. Set aside. Whisk the flour, cocoa powder, granulated sugar, baking soda, and salt together in a large bowl. Using a pastry cutter, cut in the butter until mixture is crumbly. Set aside. In a medium bowl, whisk the eggs, espresso powder, and vanilla extract together. Pour into the flour/butter mixture, then gently mix with a large spoon or rubber spatula until everything is just barely moistened. Fold in 1/2 of the chopped chocolate and all of the walnuts. Turn the dough out onto a lightly floured surface, and with floured hands, knead lightly until the dough is soft and slightly sticky, about 8-10 times. If it's very sticky, knead 1 or two more tbsp of flour into the dough. 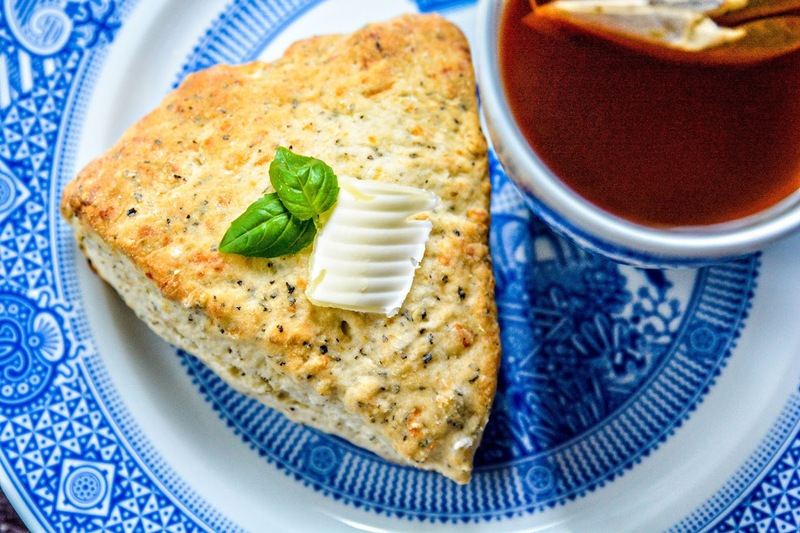 Divide the dough in half and place each half onto a baking sheet. Shape each half into a 9" long by 5" wide slab, patting down until each is about ½" thick. Using a pastry brush, lightly brush the top and sides of each slab with egg wash.
Bake slabs for 20 minutes. Remove from oven but do not turn off the heat. Allow slabs to cool for 10 minutes. Once the slabs are cool enough to handle, cut each into 1" thick slices. Set slices cut sides up, about quarter of an inch apart, on the baking sheets. Return to the oven and bake for 8 minutes. Turn biscotti over and bake on the other side an additional 6-7 minutes. The cookies will be slightly soft in the center with harder edges. Remove from the oven and allow to cool for 5 minutes on the baking sheet. Transfer biscotti to a wire rack to cool completely. 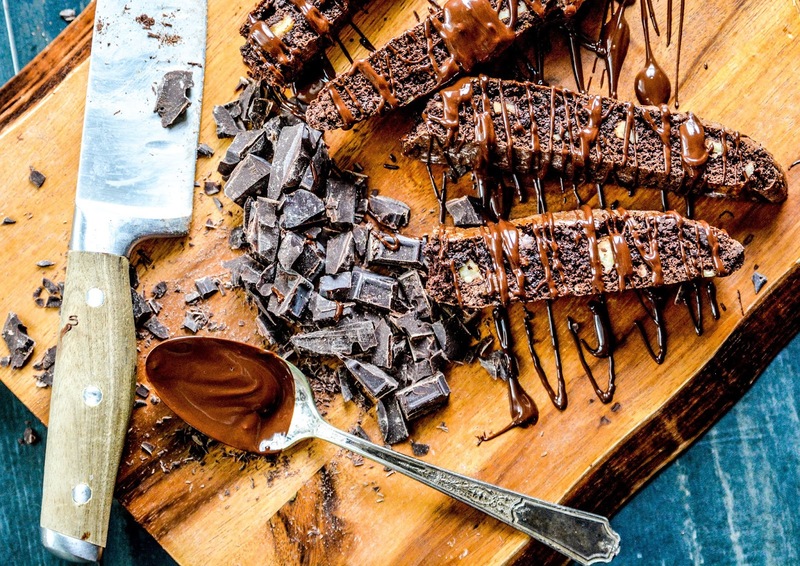 Melt the remaining chopped chocolate in a small microwave-safe bowl in 20-second increments until melted, stirring well after each increment. Drizzle over biscotti. Biscotti will stay fresh in an airtight container for up to 10 days. This drool-worthy dessert looks really pretty on the fun Calamityware plates. 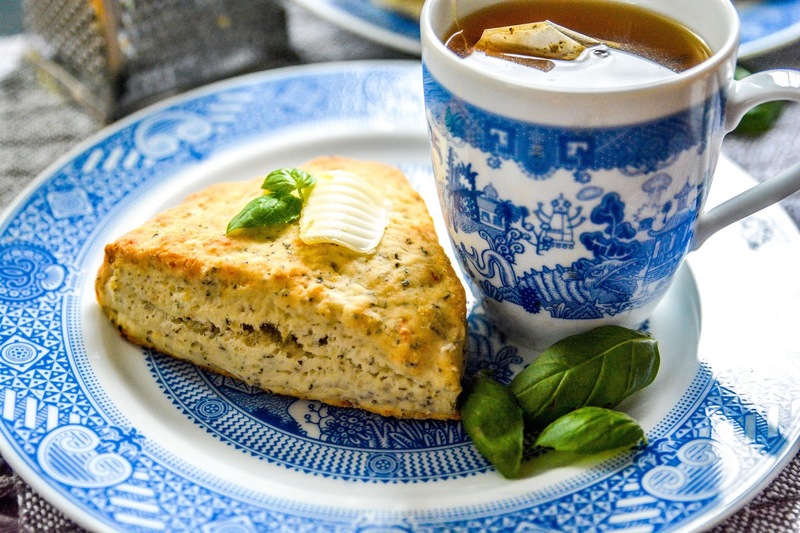 I also made some Basil & Aged Cheddar Scones for breakfast last weekend and served them on a Calamityware plate along side hot mugs of tea. In the bowl of a food processor fitted with a steel blade, combine the flour, sugar, baking powder, baking soda, and salt and basil with a few pulses. If using fresh basil, pulse in 2 second bursts until it is chopped and evenly distributed. Add the butter and pulse until it's about the size of peas. Transfer the flour mixture to a large bowl. Add the cheese and toss to evenly distribute. Add the buttermilk and stir until the dough forms a ball. Knead the dough on a floured surface until it just comes together. Roll into a round 10" wide and ¾ thick. Cut into 12 wedges. Place on an ungreased baking sheet about 2" apart and bake for 12 to 15 minutes, or until golden. Serve immediately. 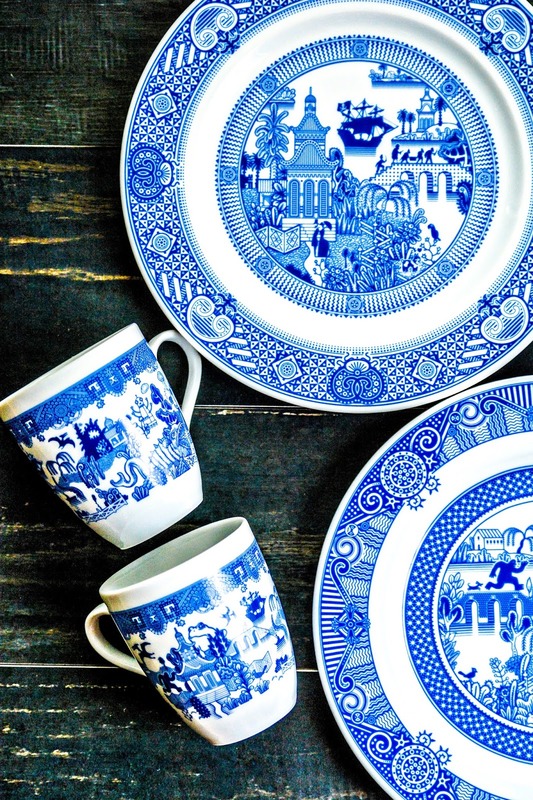 Not only can you find this incredible dinnerware on Calamityware, they also offer the whimsy designs on fabric (ties, scarves, bananas and shower curtains) as well as paper (cards, sketchbooks, prints, and note cards). Mother's Day and Father's Day is right around the corner and these would make pretty rad gifts, don't you think? I know I'll be asking for more to add to my collection! Be sure to swing by Calamityware to see more offerings and detailed pictures. If you liked these recipes, be sure to Pin them on Pinterest! Do you prefer basic dinnerware or more colorful dinnerware in your kitchen? 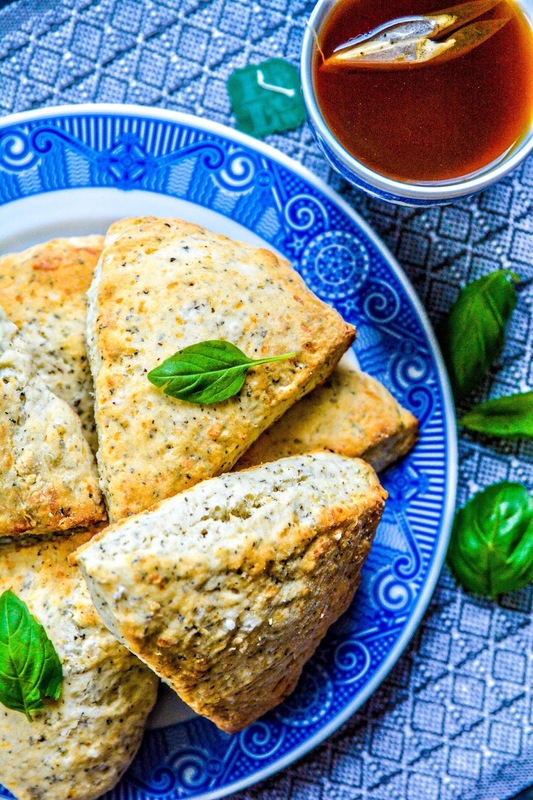 You did amazing, warm photos with them biscoti and scones! So noooom! That picture with ground chocolate and cutting board is a huge success. The dishes remind me of famous china from Flanders! Minus the Dr Who characters on them :) Hope you have where to put them! Thank you dahlink ♥ I had to Google Flanders as I haven't heard of them before. They do have some very pretty piece. I like their colorful flowers. I could serve some lovely teacakes on those. Better Google Dutch porcelain :) They make it in Flanders too, but the blue and white style is more associated to Holland, methinks, my bad. haha the little dog chasing him was a great touch. They are neat indeed. Fun random images to give a go after your plate is empty. Oh my gosh, I LOVE those plates!! I have the traditional blue and white patterns decorating the hutch in my kitchen, but those would be so much fun to throw in the mix! The little dog looks like my parents weenie dog, Gigi...and that would definitely be her chasing Sasquatch! Haha! As for everyday dishes, we use our Denby Pottery Harlequin, which has been discontinued...Boo That was our wedding china, and it's made up of mix and match sets in shades of hunter green, navy blue and cranberry red. I love them!! Aren't they beautiful!? If I had space, I'd get me a hutch and fill it with these. My mom has a weenie dog too, but he's a porky one so I don't see him running after anything hehehe. Your wedding china sounds beautiful. The color combination is probably very pleasing to the eye! Why would she hate those? I love the colors. It's not like they are all funky designs and wild colors. I think they are classic and classy. Those plates are super cute. I love those dishes, it is so funny if you don't look carefully you would miss those amazing drawings. I think they are better as artwork and displays than as dishes for that great looking biscotti. They most certainly would look lovely hanging on the walls as art! Those dishes are so cute. I think my mom has a set of 6, but it is the traditional one, real Chinese porcelain hand-painted design, and she won't let us touch them! They are so delicate we would not even dare to get near them. I think the calamity wear dishe is you featured in this post is as close we can gat to the real thing. Oh, BTW, thanks for sharing the recipe for the biscotti. That looks so good! That's funny! My mom would never let us near her tableware either. She still has it locked away in her hutch. I was always scare to even breathe around it for fear of one falling over. I hope you enjoy the biscotti! I love all the details on them! I have simple 1 color dishes. Basically it's because I have colors and crazy paintings throughout the kitchen. The crazy details are int he walls it my house. I think your house is such a fun color. Very warm and inviting! 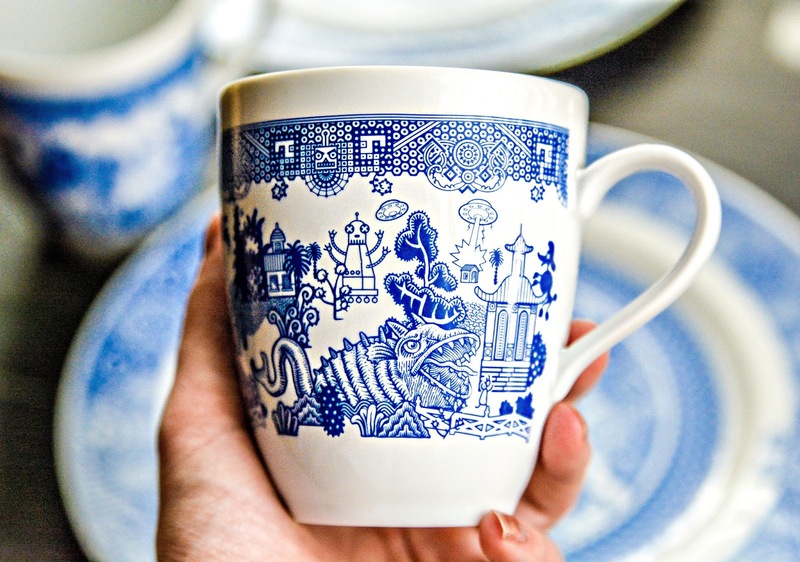 I’ve been a Calamityware fan for a few years. I like that he introduces his pieces (porcelain, textile, paper), on Kickstarter first - helping fund the firing means paying a bit less than when the remaining pieces are sold on the website. Everytime an email announcing a piece going into production is sent, by the time I get to the Kickstarter page the minimum goal has already been reached before the first hour has passed. And Don has never absombed with the funds unlike a few other Kickstarter entrepreneurs. I really enjoy when unsuspecting people finish eating or something odd on their mug suddenly catches their eye🙂 And keep an eye out for the everpresent cat. All his porcelain is produced at a factory in Poland reknown for quality, the imagary is clean and clear, and these pieces are *very* sturdy. Thank you for sharing your experience with Calamityware. Don seems like a pretty down to earth guy, from what I can tell from his bio. I don't get the feeling he's in this to grab a quick buck, but genuinely enjoys sharing his gorgeous pieces with the world. Wow those pieces are absolutely stunning! What a beautiful set of tableware! And of course that biscotti looks delicious! I love the bright blue and white colors of those dishes. Me too. It really draws the eye in. I love the cute spin on these dishes. Definitely a fun novelty and I love the hidden trinkets on this traditional design. The first look at those plates and you think how pretty then you're so surprised with all the detail with everything. I love these. The color is awesome but the detail is amazing. Sasquatch! I did a double take when I first saw them. Thought they were like my grannies old dinnerware, but then I saw the modern art, I was like, heck yes! 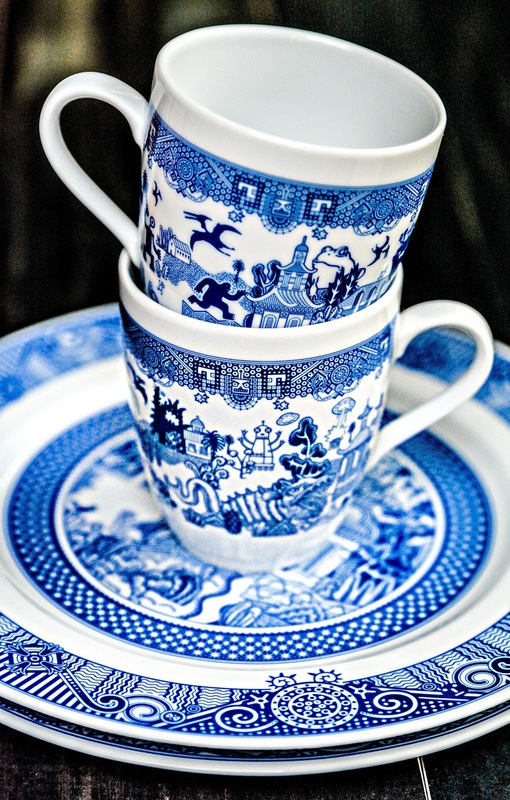 I love the whimsical designs on the blue-white china.. totally not what you would expect at first look! Such a beautiful collection indeed, Theresa. I love the blue colors and the designs!